I was doing so well... 11 posts in July, 17 in June.... then life got in the way. It started with Spa Day at the winery -- certainly the most labor-intensive thing we do. That spun almost directly into vacation. Well, I'm back and ready to report on What I Did on My Summer Vacation. 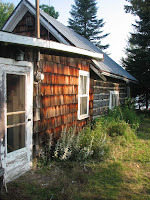 Because of our trip along Route 66 in 2006 and finances and various other things, we hadn't gotten to the family cabin in Elk Lake, Ontario since 2005. That's crazy for us -- Tommy had been there every summer of his life up until then. When you have a family business, it's hard to get a lot of family members together for vac ation. But we were able to pack our car with my sister Holly and her two girls, Bob, me, Winston, and Holly's new mixed-Beagle puppy, Snoopy. 5 people, 2 dogs, and all the luggage.... whew! Normally a 10 to 12 hour trip, with dogs that needed to be walked, this turned into 14 hours each way. 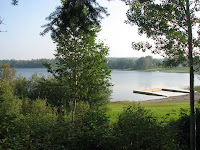 Elk Lake is a tiny logging town in northern Ontario, about 45 minutes west of the Quebec border. My grandmother and her sisters and parents homesteaded there in the early 20th century. The family still has the land where their house stood near Wabun Creek along the Montreal River, land across the street where they found silver, and the tiny log cabin in town where my great aunt Hazel lived right after she was married. 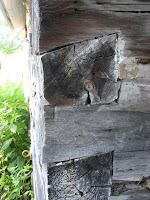 We all stay at the cabin -- it's cozy and part of our family's tradition. My great aunt Isabelle purchased it in the 1960s and added a small back addition with bathroom, laundry, and another tiny bedroom/alcove. What do you do while you're there? Other than watching the Montreal River go by, we swim at the little town beach just below our cabin, pick wild blueberries, canoe, and visit various local attractions. 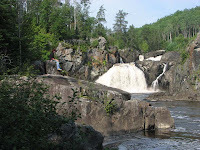 One of our favorites is Kap-Kig-Iwan, a little Provincial Park along the Englehart River with two gorgeous falls. You can hike to see the lower and upper falls, and as beautiful as it is, there's rarely anyone else there. It was a lovely week. Gorgeous weather. Yummy blueberries. And now we're back.... and I'll try to do better posting to my blog.